Residents rue that the foul smell from the unit is unbearable from 10 am to 4 pm and the public, mostly kids, are constantly falling ill.
CHENNAI: At a time when the construction of the biomining plant to clear approximately 35,000 tonnes of garbage near Sembakkam lake is nearing completion, the Pallavaram municipality officials themselves have constructed a waste segregation and composting unit inside a burial ground at Thiru-Vi-Ka Nagar in Chitlapakkam, encroaching the lake. Residents rue that the foul smell from the unit is unbearable from 10 am to 4 pm and the public, mostly kids, are constantly falling ill. “About five months ago, the officials started the construction and just when they set up an asbestos roof, we intercepted. However, the officials then told us that they were only constructing a shed to facilitate last rite ceremonies. Within two months, they built a concrete structure and put up a board saying, ‘Compost Yard for ward 20’,” said Umapathi, a resident of the area. He added that when the residents protested again, the officials informed them that the civic body will soon receive processed fertiliser, and this place would only be used to stock them. “When the actual operations began a month ago, we realised they were getting the garbage, segregating it, churning it and then making fertiliser,” he said. He also said the lake, which was previously spread across 60 acres, shrunk by half due to encroachments. The National Green Tribunal that establishments encroaching the lake should discontinue operations. 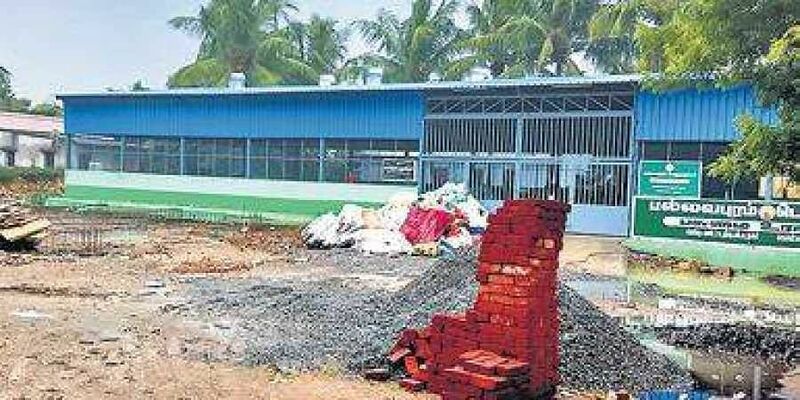 When contacted, the Public Works Department officials confirmed that the composting unit is an encroachment and promised they would take an action against the issue.Pallavaram officials refused to comment on the issue.